The people of Burnfoot are being given one last chance to revive their community council. The estate has been left without a community council for three months because not enough nominations were received for a proposed election in August. A minimum of six nominations for seats are required for a new council to be established, but that threshold was not reached. As a result, a three-month abeyance period was required before an election could be called again, and during that time, a petition calling for another vote, containing more than 20 signatures, was collected. 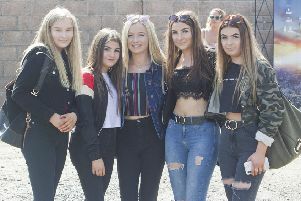 Members of the proposed new community council would be expected to get involved in organising events such as the Burnfoot Carnival held earlier this year. Nominations reopen today, and returning officer Stuart Marshall, a councillor for Hawick and Denholm and also the town’s honorary provost, is urging members of the public to step into the breach. He said: “It is absolutely vital that we get enough people to come forward. “I see this as a last attempt to rescue this body. “Burnfoot is such a great place to represent, and at the moment I have nine expressions of interest, and one can only hope that all of these people submit their application forms. “If anyone would like an informal chat about community council life, or would like a nomination form, please do not hesitate to get in touch. “I am quietly confident and would urge the people of Burnfoot to seriously consider coming on board. Residents have until noon on Thursday, November 24, to put their names forward. Nominations are available from Burnfoot Community Hub, in Burnfoot Road, or by emailing Mr Marshall at smarshall@scotborders.gov.uk or calling 077673 23189. Papers are also available from Judith Turnbull, democratic services officer at Scottish Borders Council, on 01835 826556.